BBC iWonder - Why is Britain a wildlife migration hotspot? Why is Britain a wildlife migration hotspot? Can you imagine traveling to the moon and back three times? Well that is the same distance the Arctic tern covers during its lifetime. This remarkable little bird can be seen here in parts of the UK in summer during its epic migration between Greenland and Antarctica. Of course, Arctic terns are not the only ones to visit the UK and then leave. Hundreds of millions of animals do it each year, with some traveling tens of thousands of miles to reach our shores, often risking their lives. But what makes the UK such an attractive destination for wildlife to visit? Animals travel vast distances to the UK: from the cold expanses of Siberia to the exotic South American coast and many places in between. Click on an animal to reveal more about their incredible journeys (all images copyright naturepl.com). Many species, such as swallows and cuckoos, arrive in the UK during spring from the south (e.g. the Mediterranean and sub-Saharan Africa). They come here to breed because the further north they go, the more food there is and the more light to search for it, as many are insect eaters. They return south in the autumn with the new young, when food becomes scarcer as winter approaches. Tens of millions of birds arrive during the autumn, including colourful thrushes such as fieldfares and redwings, geese and swans. They come from far afield, after traveling for several thousand miles from the north and east (Scandinavia, the Arctic and northern Europe). The main reason for this mass migration is that food in their breeding grounds is often hidden under snow and ice. 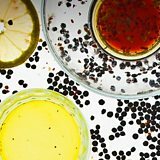 The UK offers much milder weather in winter and food is easier to find. In spring, these animals return to their relatively safe breeding quarters. 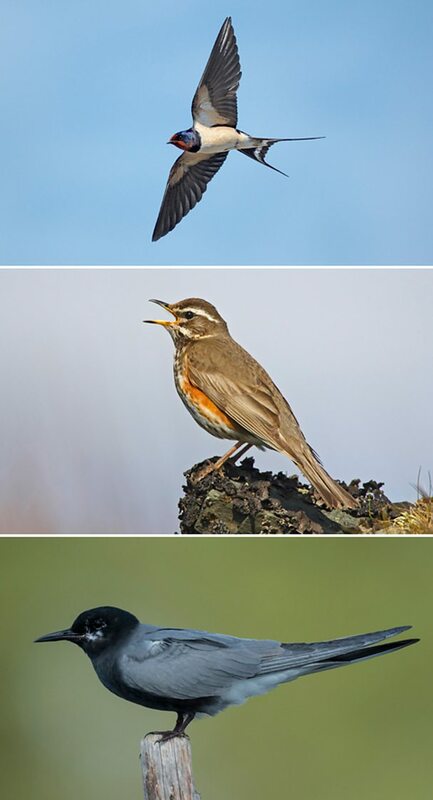 We in the UK have our own resident populations of birds such as robins and starlings that we see all year round. But during winter their numbers are bolstered by migrants fleeing the extreme cold of Eastern Europe. Passage migrants are birds that stop off in the UK during their long journey north or south, such as black terns and little gulls. They use the UK like a service station, taking a few weeks during spring and autumn to refuel and rest before moving on and completing their journeys. One of our most nutritious habitats are our estuaries, but why? Over the course of a year, one square metre of the UK's mud produces 200,000 kcal - the equivalent of 77 standard chocolate bars - and is second only to rainforests and coral reefs in terms of calorific productivity. The UK has a large coastline and lots of coastal wetlands and estuaries, which are particularly important for waders and wildfowl. A quarter of all the estuaries in north-western Europe are found in the UK. 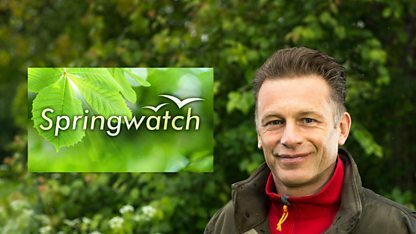 In this archive clip from Autumnwatch, Chris Packham and Kate Humble reveal that our estuaries are a buffet for three million birds. The numbers of individuals visiting the UK are an estimate and can vary greatly year to year. The data for painted lady butterflies is from 2009 and estimated by radar and citizen recorders. There were around 25 million after breeding. We have some spectacular butterflies in the UK, but only a few are true migrants: red admirals and painted ladies for example. They arrive in their tens of millions from the Mediterranean to take advantage of our summer plants as a food source for their caterpillars. It’s common plants such as thistles and nettles they’re after of which we have plenty - although it’s not the same generation that leaves as arrived! 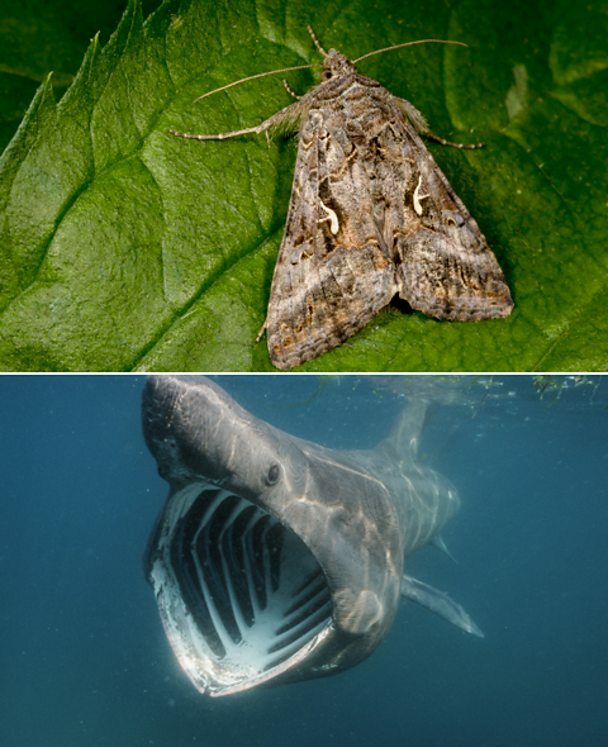 The silver Y is our most common immigrant moth and can arrive in numbers up to 250 million in a good year, with a staggering four times that many leaving as arrived. The UK is home to high numbers of the second largest fish in the world: the basking shark. From May to September, these filter-feeding sharks are attracted inshore to places with regular, reliable tidal fronts - places where different water masses meet - where the tiny plankton they eat are concentrated. Recent studies showed they spend winter periods travelling to depths of up to 1,000m in search of feeding ‘hotspots’ and may continue to move thousands of kilometres during the winter months, actively tracking plankton blooms in order to feed. It can be hard to tell which animals live in the UK all year round and which migrate here. Pick an animal to see if it is a resident or just visiting. Our large resident populations are swelled considerably by starlings from Eastern Europe in winter. Don’t be fooled by the name! Canada geese were introduced in the mid 17th Century and are now resident. A very common moth and true migrant; up to 250 million can arrive with four times that leaving. Waxwings arrive in large numbers when the population outgrows the food supply. A mass arrival of birds that do not usually visit is known as an irruption.